Are your Brampton garage door tracks dented or bent? Let us fix them. When it comes to tracks, we offer fast services. Most track problems are fixable. But if they are extensively dented and a waste of money to fix them, our technicians can also replace them. You can trust us to align your tracks properly, fix their dents, and install them in their right position so that the door won’t bind or jam. At our Garage Door Repair Brampton team, we also fix and replace rollers. Sometimes, damaged rollers and lack of lubrication are the source of track damage. 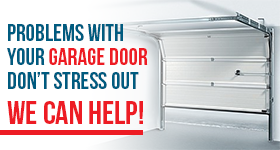 No matter what the problem with your garage door tracks and rollers is, trust that we can take care of it. If your garage door tracks in Brampton are not aligned, the rollers will have a hard time moving. The cable might come off and the door might jam. When you are suddenly faced with any of these problems, call us to check if the tracks are out of alignment or damaged. Track problems and damaged garage door rollers will also make the door noisy. The tracks act as the rollers’ guides. If they are not greased right or the rollers are corroded, one steel part will scratch the other causing complete damage and loud noise. Our experts can take care of these parts by offering fast garage door tracks repair. But there is also a need for routine services. When garage door tracks are filthy, the rollers will still have a hard time sliding up and down. What we do is clean built up debris and then lubricate. Are the rollers completely damaged? We offer garage door roller replacement. Our experts can replace the top, middle, and bottom rollers but also the hinges. It’s always best to refrain from such tasks yourself because the bottom rollers are attached to the bottom brackets, where the tensed cables are also attached. If the tracks are not installed or aligned properly, the door won’t be safe. So leave garage door tracks replacement to us. Call us for your roller and track needs in Brampton, Ontario, today.